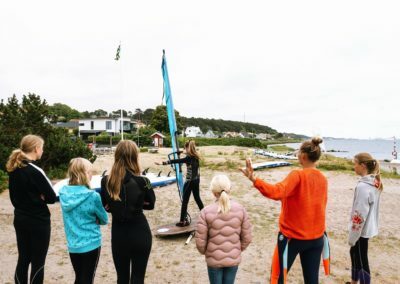 The WeSurf Girl Camp is a windsurfing camp for young girls in Hittarp, a small town in Southern Sweden that sits at the narrowest point of the Öresund, the body of water that separates Sweden from Denmark. The sound is just three miles across there and it’s a great location to teach beginners and rapidly progress to open water adventures. The camp is the brainchild of two enthusiastic young windsurfers, Sara Blixt and Emma Martinsson. We asked them to tell us more about it! We had very few girls at the club and we decided to do something about it! 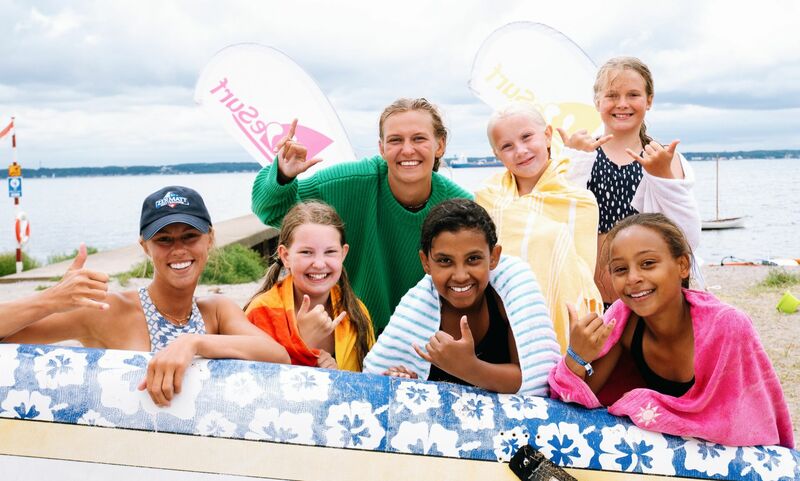 Story: Sara Blixt and Emma Martinsson | Photos: WeSurf Girl Camp. H i! We’re two girls who love to spend lots of time on the water! We both grew up near Hittarp, a little town outside of Helsingborg. It’s an old fishing village with a small beach and two piers that lead out into the ocean. Behind the beach, there’s a wide grassy area and two large green containers filled with Kona boards! That’s the heart of the WeSurf Hittrap windsurfing club. WeSurf has been around for many years. 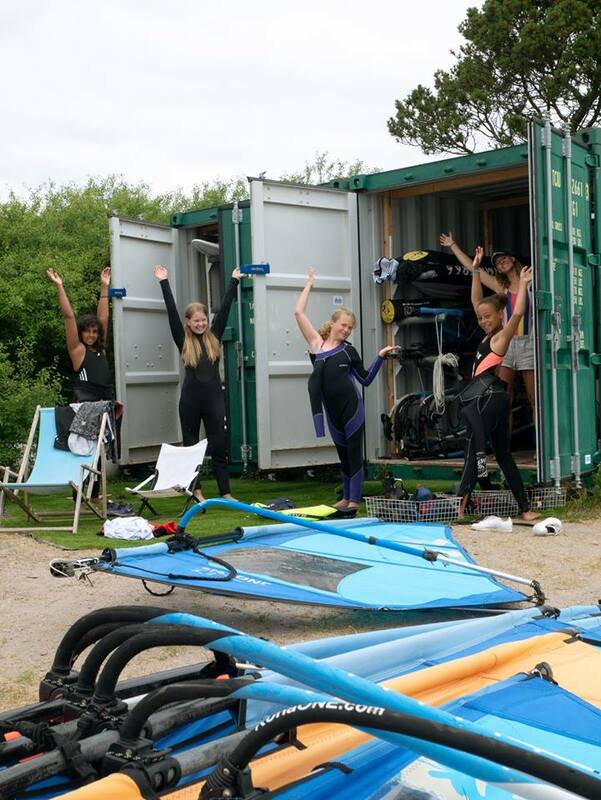 The container doors are opened all summer long to anyone who wants to be part of the surf school. A family-friendly surf community has developed, and every year brings new faces and more sails on the water. 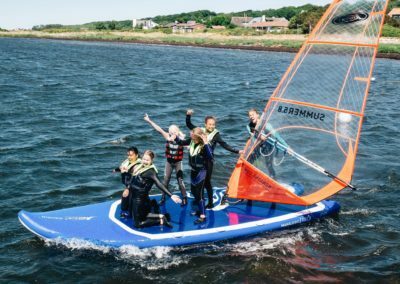 However, we’ve had very few young girls over the years come and try windsurfing at the club, and even fewer sticking around, so we decided to do something about it! 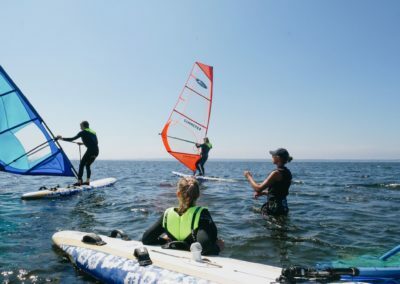 Our idea was to attract more girls by creating a camp that not only focused on windsurfing, but also on building the feeling of being part of a cool community. Each WeSurf Girl Camp in Hittrap lasts for four days, Monday through Thursday, and we run the camp every week in July – when other school sports in the area are taking a break for the summer. It’s our first year doing this, and we’ve had 20 young girls in the program already! The vibe is really good, and many of them are coming back to hang out and windsurf even after their camp is over. We start each new camp with some time getting to know each other, and then we quickly transition to windsurfing theory and rigging. After some practice on the land simulator, we hit the water. 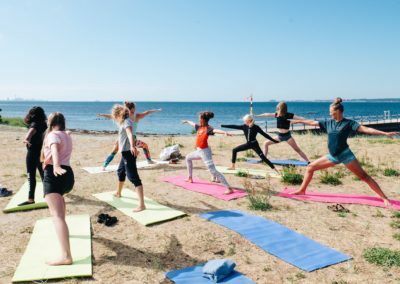 Since we want the girls to get the full experience of the Kona lifestyle, we mix the windsurf sessions in with yoga and balance practice. 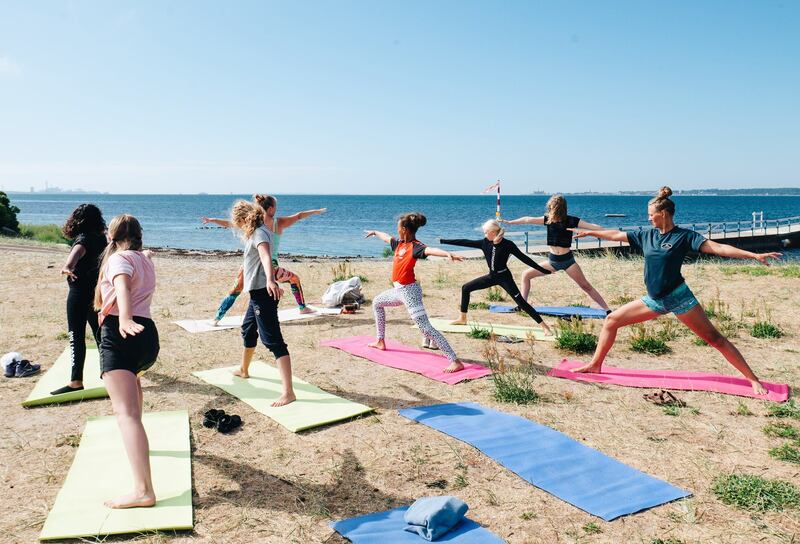 Neither of us has done much yoga before, so we collaborated with a local gym that happened to run yoga sessions on the lawn next to the club, and it’s been awesome for everyone! 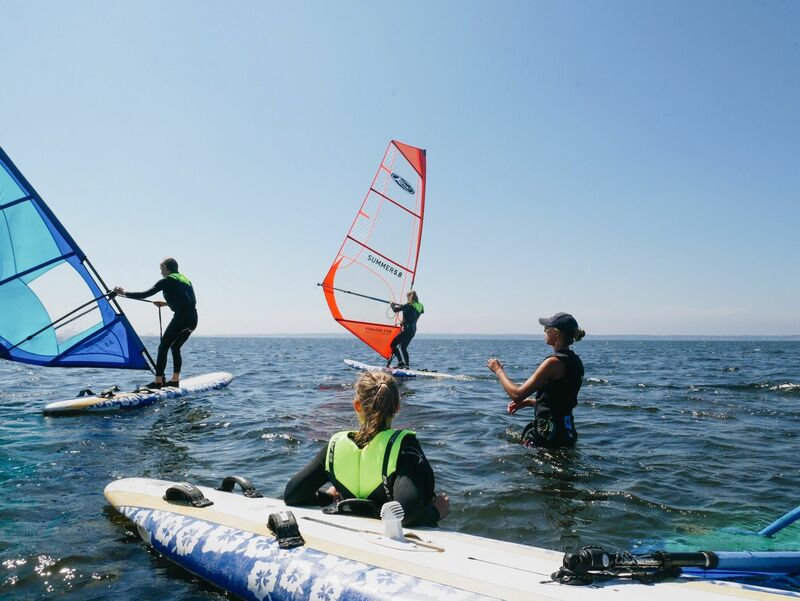 We make a great team, and we’re really happy to see how the camp we just started has already brought more girls and their families from all over Helsinborg to our local Kona windsurfing community in Hittarp! They learn to windsurf and make new friends, and we make new friends too! When girls get to a certain age, many sports become much more competitive, we’ve noticed. You have to decide if you want to fully commit or simply quit. There’s no middle ground. With windsurfing, and especially on a Kona, you don’t have to make that choice. For sure, you can be really serious about it and spend all your free time with it, but most girls want something they can do at their own pace and with their own buddies. In the process, they do something athletic, spend time on the water, and learn skills they can depend on for the rest of their lives. The girls who take our camp feel truly empowered, and we both feel truly empowered too to have a chance to bring something so special into their lives! 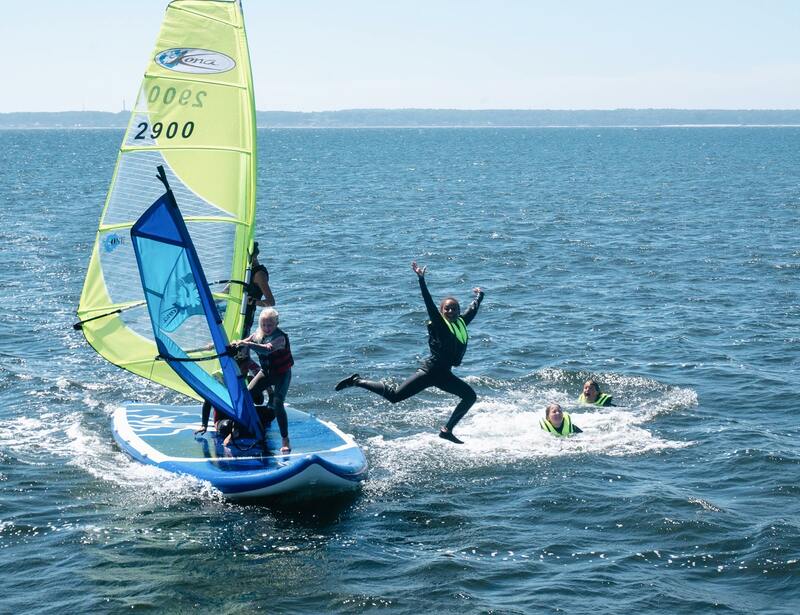 Note from the editor: Sara started windsurfing a the WeSurf club in 2011, 7 years ago, and two years later she got a chance to become an instructor there. Today, she splits her time between Hittarp in the summer and Guadeloupe in the winter, where she’s lucky to be teaching windsurfing too. Emma took a job as an activity guide at the same hotel where Sara is teaching in the Caribbeans, and in their free time Sara taught her how to windsurf. The rest is history!